We caught the plane from Incheon International airport in Korea, and after a couple of hours we arrived in Osaka, Japan. I didn't take any photos when we first arrived as our main concern was trying to find a hotel, not having booked anything in advance. After finding a hotel and having a good night's sleep, the next day we went out for a walk in the morning, just wandering around the local area near where our hotel was. 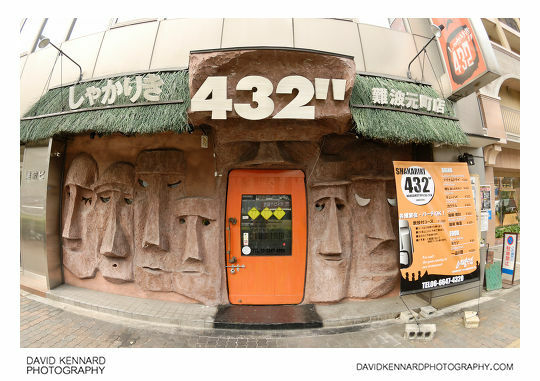 I took a photo of this interesting restaurant, which has a front modelled on the Moai Easter Island statues. I'm not sure what the Moai have to do with the restaurant though. The restaurant specialises in Kushikatsu (串カツ), a Japanese style of deep fried kebab - nothing to do with Easter Island. Down a small side street we passed this large stone torii (鳥居) gate, and so decided to go inside and have a look. 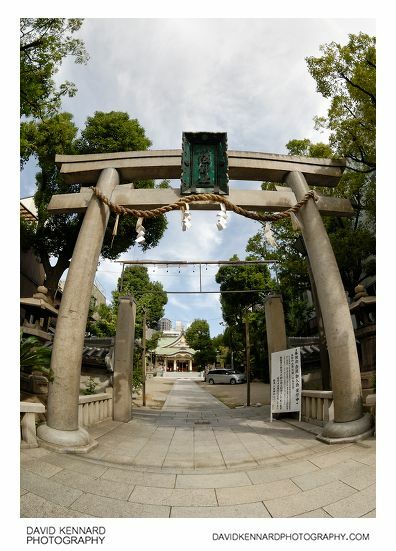 The gate was the main entrance to Namba Yasaka Shrine (難波八阪神社 Namba Yasaka Jinja), a Shinto shrine. 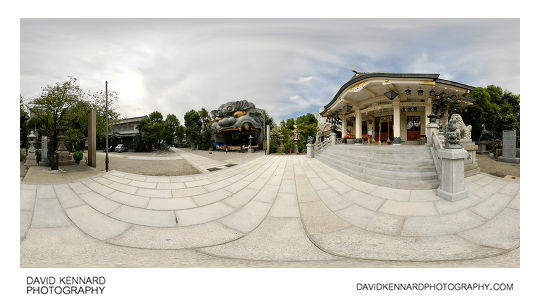 I took a panorama inside the shrine grounds, which you can see above, or the 360° version is here. The shrine was once a Buddhist temple, but was closed after the Meiji restoration in 1868. The new government at that time instituted a separation of Shinto and Buddhism policy (神仏分離 shinbutsu bunri) to try and reduce the importance of Buddhism and increase the importance of Shinto and the Emperor. Today the shrine is much smaller than the temple would have been prior to the Meji restoration. You can read more about about the shrine at Osaka Tourist Guide - Namba Yasaka Shrine. 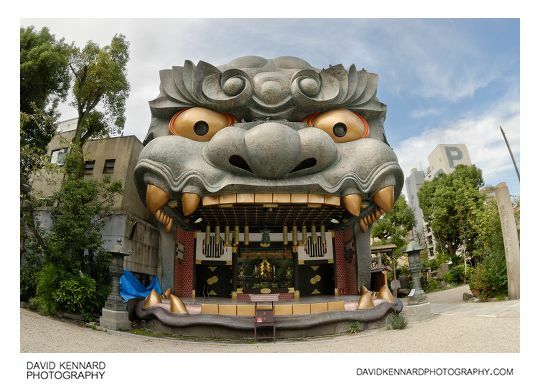 This is the Lion stage (獅子舞台 Shishibutai), a great looking building. Inside the lion's mouth is a stage where they have dances on special festivals. If you have a look at GORIMON's photos on flickr, they have some photos of people using the stage at a festival. I was surprised to find that the lion building was built in 1975. To me it looks much newer than that. There were quite a few pigeons sitting on the lion's face, so I think the people who look after the shrine must do a very good job at keeping the building clean. In part of the shrine they had these mini shrines. This one has small fox statues outside it. 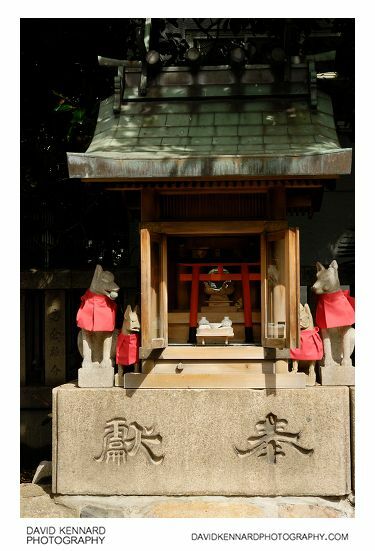 We saw a lot of these fox statues during our Japan visit, though I thought they were dog statues. The fox is associated with the kami (similar to a god or spirit) Inari, who is one of the principal kami of Shinto, and is the kami of fertility, rice, agriculture, foxes, industry and worldly success. 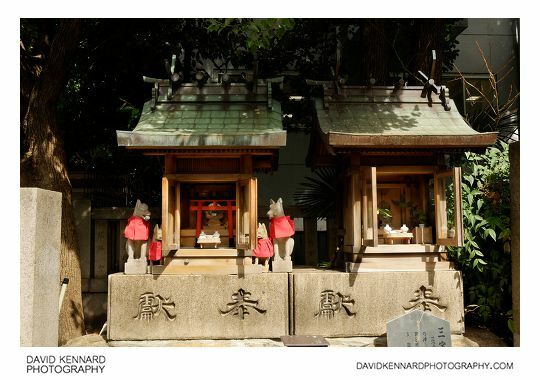 This is a wider view of the small Inari shrine, to the right of it is a small shrine dedicated to the kami Sanbō-Kōjin (三宝荒神), the kami of fire, the hearth, and the kitchen. 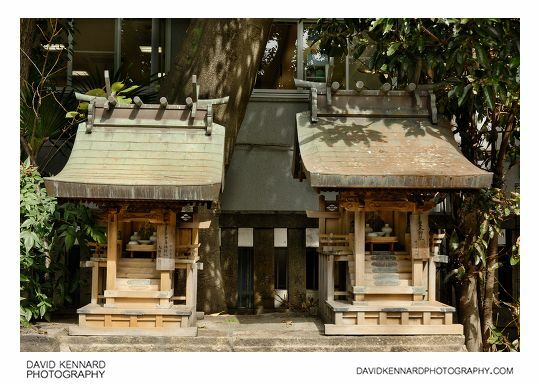 This is another two mini-shrines, the one on the left is dedicated to the Japanese island of Ikishima (市杵島神社), while the one on the right is an Imperial Shinmei shrine (皇大神社).